Pictured L-R: Barak Moffitt, global head of strategic operations, Universal Music Group; Maureen Droney, Managing Director P&E Wing; Ryan Ulyate, Producer/Engineer; John Jackson; VP A&R/content development, Sony Music Legacy Recordings; Eric Boulanger, Chief Mastering Engineer, The Mastering Lab; and Bruce Botnick; VP, Content Acquisition, Pono Music. Photograph courtesy of The Recording Academy®. © 2015. Hi-Res Music Symposium at Capitol Studios in L.A.
Santa Monica, Calif. (April 9, 2015) — As part of its ongoing efforts to advocate for high-resolution audio and related issues, recently The Recording Academy® Producers & Engineers Wing® participated with DEG: The Digital Entertainment Group, in a Hi-Res Music Symposium at the legendary Capitol Studios in Los Angeles. The day began with opening remarks from Marc Finer, senior director, DEG: The Digital Entertainment Group. A keynote from legendary producer and president of Blue Note Records Don Was followed, in which Was described the importance of sound to a recording, citing examples from his storied career. Next was the panel "Past Is Prologue – What Does It Take for a Format to Succeed?" with moderator Howie Singer (chief technology strategist, Warner Music Group) and panelists Jac Holzman (founder, Elektra/Nonesuch Records) and George Lydecker (vice-president, engineering/R&D, Warner Music Group). This was followed by the panel "Meet the Hi-Res Music Creators" with moderator Maureen Droney (Managing Director, The Recording Academy Producers & Engineers Wing) and panelists Bruce Botnick (vice-president, content acquisition, Pono Music), Eric Boulanger (chief engineer, The Mastering Lab), John Jackson (vice-president, A&R/content development, Sony Music Legacy Recordings) and Ryan Ulyate (producer/engineer: Tom Petty, Jeff Lynne, Eric Clapton). A playback session of high-res recordings in Studio A's control room was kicked off by Barak Moffitt, global head of strategic operations, Universal Music Group, featuring high-res versions of Frank Sinatra songs originally recorded in that very studio. Other music included cuts from the just-released complete Tom Petty catalog and the high-res remasters of Lou Reed's catalog that Reed himself had overseen just prior to his death in 2014. More panels followed: "The New Business of Hi-Res Music" with moderator Finer and panelists Jim Belcher (vice-president, technology & production, Universal Music Group), Mark Piibe (executive vice-president , global business development, Sony Music Entertainment) and Singer. Next was "Understanding Hi-Res Distribution" with panelists Randy Leasure (vice-president, business development & content Marketing, Pono Music) and Lisa Marks (senior vice-president and general counsel, HD Tracks). After lunch, Ben Arnold, executive director of The NPD Group presented "Setting the Stage for Hi-Res Audio," citing recent research and trends. Finer moderated the next panel, "Hi-Res Devices for Every Lifestyle" with Phil Baker, vice-president, product development & operations, Pono; Jeff Hiatt, director, home audio, Sony Electronics; Owen Kwon, president, Astell&Kern; and John Quick, general manager, dCS North America. A second playback session in Studio A was followed by the day's closing comments from Moffitt. "The market for high-resolution audio is growing and continues to be of key interest to our membership," stated Droney. "Working closely with the Digital Entertainment Group, we are continuing to raise awareness of hi-res audio and its wider implications to our industry as a whole." 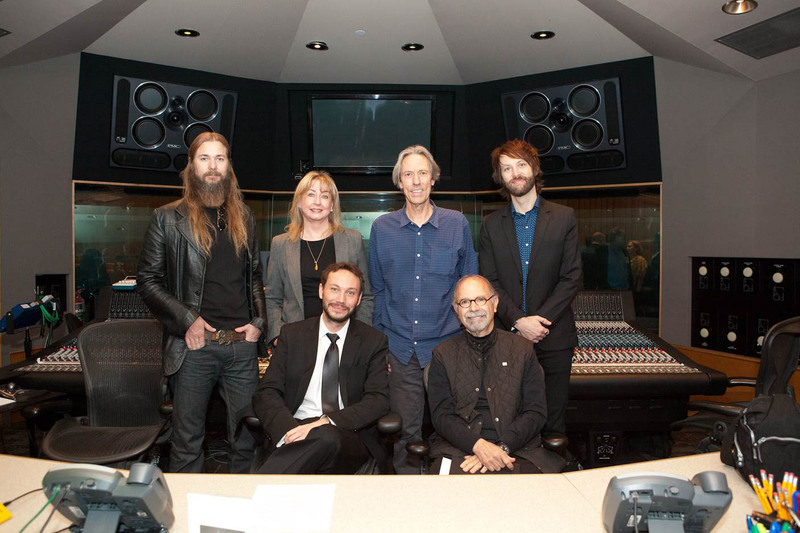 Photo Caption: Pictured L-R: Barak Moffitt, global head of strategic operations, Universal Music Group; Maureen Droney, Managing Director P&E Wing; Ryan Ulyate, Producer/Engineer; John Jackson; VP A&R/content development, Sony Music Legacy Recordings; Eric Boulanger, Chief Mastering Engineer, The Mastering Lab; and Bruce Botnick; VP, Content Acquisition, Pono Music. Photograph courtesy of The Recording Academy®. © 2015.